C leveland’s never-ending winter looms in the distance, and you know what that means. Yes, it’s time to say goodbye to that beach bod and start packing on some extra cold-weather padding -- and how better to do that than by taking a run at the best pizza places in the county? Whether you’re a sucker for locavore Neapolitan pies or you just want a humble, classic slice, Cleveland’s got more than enough reliably excellent pizza joints to keep you busy until summer’s back. Three words: Get the Lardo. OK, yes, we are suggesting you order a pizza topped with cured fat. But honestly, just give it a shot: It’s a can’t-miss, especially when paired with roasted garlic, fontina, Taleggio, and rosemary. Wash your pie down with a quality selection of (as the restaurant's name would suggest) reasonably priced wine, craft cocktails, or beer, in a casually romantic setting. With a dimly lit, European bistro-like atmosphere, Marotta's is the kind of neighborhood spot you wouldn’t mind settling into night after night for a good glass of wine and a generous serving of quality Italian comfort food. Although it’s hard to pass over the tempting array of homemade pastas and entrees, pizza aficionados are wise to head straight for the pies. Ample (but not-too-thick) crust serves as the perfect vehicle for transporting a bevy of delicious toppings, such as fresh mozzarella, salty prosciutto, and roasted garlic, straight into your mouth. At Citizen Pie -- a small cafe equipped with a giant pizza oven -- there is no mistaking what you're in for when walking through the doors. Ultra-high-quality ingredients grace the top of doughy, charred crust, resulting in one of the best Neapolitan-style pizzas you can find anywhere in town. 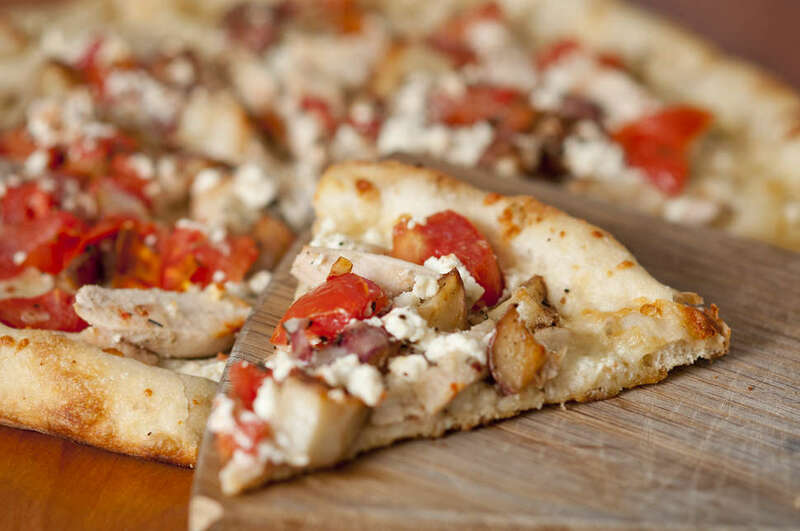 Don’t miss the Mushroom pizza, topped with mozzarella, brie, porcini duxelles, bacon, red onion, and truffle oil. Plus, thanks to the recently opened Ohio City location, it’s now easier than ever to get ahold of Citizen Pie’s... pies. Now in a roomier new space on Professor Avenue, this Tremont spot is turning out some legitimately inventive pies, giving umami-minded diners a host of off-the-wall pizza options to sink their teeth into. Try the mixed mushroom, topped with goat cheese, fresh thyme, garlic, caramelized onion, balsamic reduction, Pecorino Romano, mozzarella, and, oh yes, an indulgent drizzle of intoxicating white truffle oil. Oh, and the individual slices are seriously massive, which is exactly what you want in an individual slice. Situated smack in the middle of the suburbs, A Slice Above can be easy to drive right past, but it sure is a shame if you do. This long-standing shop cranks out piping-hot pies that range from ultra-traditional to ultra-decadent, all on puffy crusts. Don’t miss the Veggie Patch, a combination of mushrooms, onions, green peppers, broccoli, sliced tomato, and black olives, all buried under a heap of mozzarella and provolone. Almost healthy, but not. Edison’s gooey, thick pies are just what the doctor ordered after an indulgent night of drinking. Generous slices are available for those in a hurry, though Edison’s specialty pies are definitely worth the wait (and it's open late). Try the BBQ chicken with homemade sauce, onions, a blend of cheeses, and a side of honey for some oh-so-necessary dipping. 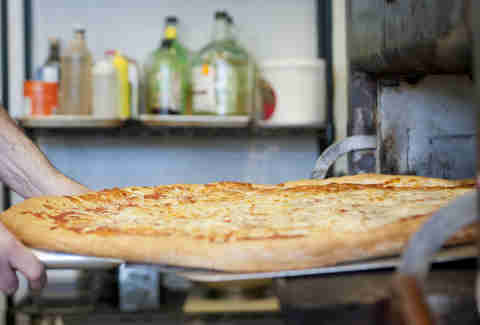 Of course New Yorkers know their stuff when it comes to great pizza, and Vincenza’s is about as close as you can get to a classic NY slice here in Cleveland. Lunchtime is prime time at this joint, which is only open during the week, and closes at 6:30pm. So get in line, and don’t mind the wait -- we promise you’ll be deliciously rewarded for your patience. There’s nothing quite like the classic pizza & beer combo, which makes Bar Cento a particularly welcome addition to Cleveland’s unofficial brewery district. Go for the Sunnyside, topped with provolone, house-made pancetta, and an egg with a unctuous yellow center that, as you pull the slices apart, oozes across the top of the pie. Vero’s owner does not mess around -- this dedicated fella makes each batch of dough, each pizza, every day. These seriously delicious Neapolitan pies are made from simple ingredients, hand-rolled, and cooked in a wood-fired oven for just 90 seconds. The result is crispy on the outside, chewy and soft inside, meant to be eaten straight out of the oven, and left uncut. Mangia! 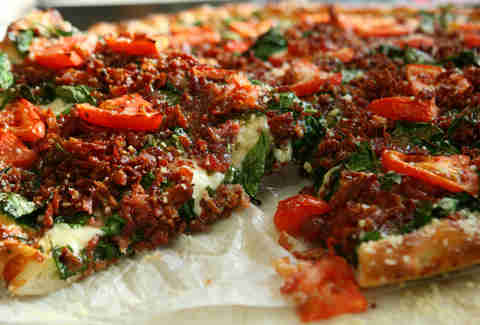 Light-as-air thin-crust pies certainly have their place in our pizza-loving hearts. But when you’re in the mood for something more substantial, Angelo’s has you covered. Thick, saucy crusts are generously topped with plenty of cheese and a generous shower of toppings. 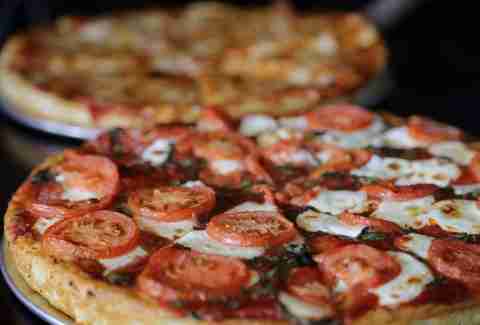 Sometimes we like our pizza abundant, and Angelo’s does it right. 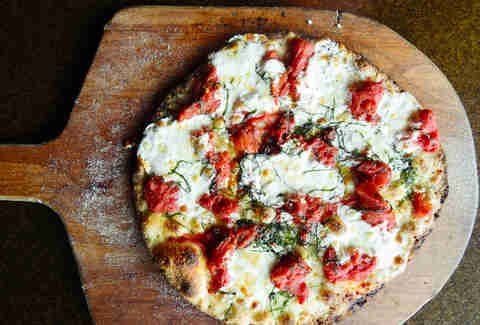 Tomori’s has gained a loyal following for its tasty, thin-crust pizzas that can’t quite be classified in one specific genre. Try the Tomori’s Favorite, topped with prosciutto, homemade sausage, tomato, Kalamata olives, extra Parmesan, provolone, and mozzarella cheese. Clearly this guy knows his pizza, so we’ll take what he’s having. 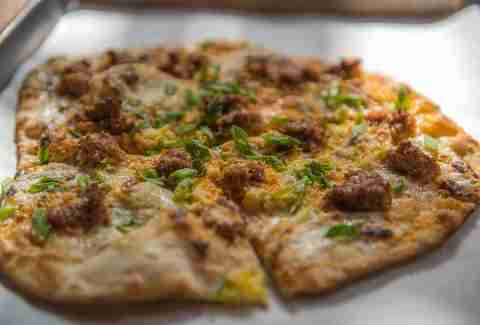 The pizza at this brewpub ranges from traditional New Haven-style (with pecorino Romano instead of mozzarella) to specialty pies that tweak the New Haven recipe with ingredients like pork shoulder, honeycomb, and kung pao sauce. Or, if you’re feeling particularly artistic, you can craft your own pie from among the various sauces (Sriracha! ), cheeses (gorgonzola! ), proteins (confit duck! 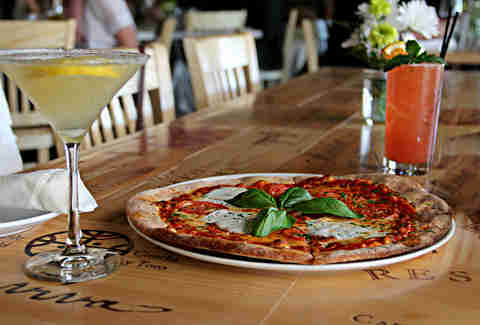 ), and other toppings on the menu. Whatever you end up making, be sure to wash it down with something from the tap list. This local institution’s been around since 1963, and though it’s changed hands more than a few times over the years, the recipe’s still the same as it ever was. Keep it simple with a chunky sausage pie, or go for one of the specialty pizzas like the Pepperoni Feast -- which, admittedly, is just a standard pie covered in tons of pepperoni. Artisanal ingredients are all well and good, but sometimes you just need to get back to basics. Vying with Dante’s for the affections of West Park’s pizza-hungry populace, Athens has its own bevy of specialty pies to choose from. Whether you opt for the aptly named Pig Out Pizza (pepperoni, ham, bacon, and sausage) or the less-traditional Athenian Pizza (garlic butter sauce, gyro meat, onions, tomatoes, and provolone, with cucumber sauce on the side), you’re bound to find something to love here. Beth Phillips is a Cleveland-area writer who will totally eat all the mushrooms you pick off your pizza (the horror). You can follow her on Twitter: @CraveableCLE. Gianni Jaccoma is an editor at Thrillist, and his body is composed entirely out of pizza. Please do not eat him. Follow him on Twitter instead @gjaccoma.